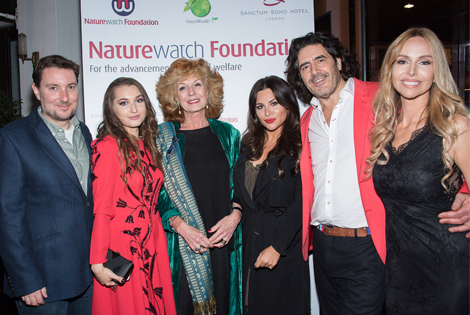 On October 25th, Naturewatch Foundation launched “Compassion Over Cruelty” – a film to defy expectations around cruelty-free cosmetics. Rula Lenska, Anneka Svenska, Jake Yapp, Vicki Michelle, Matt Johnson, Dan Richardson, Olivia Cox, Nicky Campbell, Wendy Turner Webster, Gary Webster, Cindy Jackson, Bryony Blake, Jilly Johnson and others attended the private event at the Sanctum Hotel in Soho, London. As part of our Compassionate Shopping campaign, Naturewatch Foundation produced a film showing how beauty can come without cruelty as well as the benefits of using ethical beauty products. Brits blindly buy into the multi-billion pound beauty industry, funding animal abuse for vanity products. Naturewatch Foundation was the first organisation in the UK to make a comprehensive cruelty-free guide available to the public, and today, the 14th edition continues to highlight why it is so important to understand animal testing policies behind cosmetic products. In “Compassion Over Cruelty”, we recruited top hair stylist Daniel Field, and make-up artist to the stars, Alexa Riva Ravina, to put cruelty-free, compassionate, cosmetics to the test. Volunteering for a cruelty-free makeover in the film were actress, Rula Lenska, wildlife expert Anneka Svenska, model Daryna Milgevska, and comedian Jake Yapp, who put their faith – and faces – in Daniel and Alexa’s hands.